Knowledge Consortium of Gujarat KCG Issued a Advertisement For Recruiting 112 Program Officer, Project Executive.All Eligible And Willing Candidates Can Check Detailed Advertisement From Their Official Website &Apply Online/Before12-07-2017.Eligible And Interested Candidates Can Check Detailed Information For Each Postion Such As - Eligibility Criteria, Qualifications, Age Limit, Selection Procedure Before Applying. Candidates Must Pass Graduation or its Equivalent Qualification From A Recognized Board / University. Candidates May Fill the Online Application Through Ffficial Website (http://www.kcg.gujarat.gov.in). before (12-07-2017). Important Dates : Last Date for Registration of Online Application Form Is: 12-07-2017 . 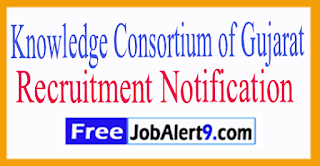 Click Here For KCG Recruitment 2017 Detailed Advertisement.